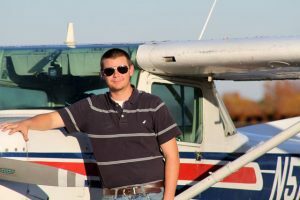 Patrick Allen pictured next to Empire Aviation’s Cessna C152 after successfully completing his first three solo takeoffs and landings at the Henerson-Oxford Airport (KHNZ) on Tuesday, November 8, 2011. Awesome job, Patrick! !